Kathy serves as liaison between the development, management, and construction teams during multifamily project development. 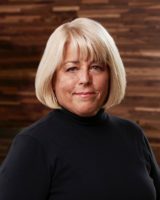 She is directly involved with the design of site layouts, floor plans, and clubhouses; the unit mix; and selection of interior and exterior finishes. She directs the project marketing strategy, including theme and logo development and leasing materials design. She works with the construction team as modifications are made to original building plans and selected materials. She ensures all phases of the development process work together so that the end product exceeds expectations. Kathy enjoys family vacations in Florida and Colorado, and spending time with her nieces and nephews.